Discover a better way to manage the apply/review/manage cycle with WizeHive. Our cloud-based ZengineTM platform streamlines and improves the grant management processes of more than 750 satisfied clients, including leading foundations, associations, corporations, and universities. 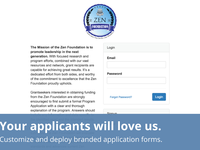 Zengine can also be your go-to solution for award, internship, accreditation, and other application-based processes. Thanks to Zengine's flexibility, it's distinctly fast to deploy and easy to tailor and integrate. This interface is easy to learn and use, and when questions arise customer service is very helpful! Pros: Customer service is very helpful and responsive. They're helpful in answering simple fix questions, as well as brainstorming on how their software can accommodate more complex requests. 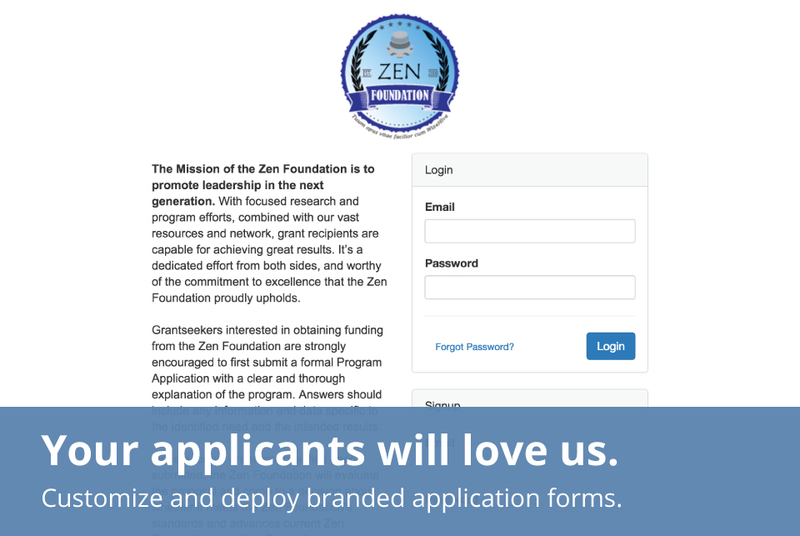 Very easy to build your own application form, as well as follow-up forms. The interface can be customized to fit your organization's branding. Online help articles are very helpful and easy to follow. Easy to create and customize reports. Easy to create a new workspace - its basically a copy, paste function. Overall - if we were to go through this process again, we would make the same decision to use WizeHive. Cons: Applicants have to create new credentials every year in order to access their application so, they have separate logins for the year they are reporting in and the year they are applying for - that can get confusing. Yearly workspaces cannot communicate with one another so doing YTD comparisons can be challenging. There are some features, such as the calendar and cascading forms, within WizeHive that I wanted to utilize but were not sophisticated enough features to make it worthwhile. Sending an e-mail to users through the WizeHive app comes from the WizeHive domain and frequently goes to the spam folder. While you can direct replies to an internal e-mail, I would like for the e-mail to also appear as though it was sent from our domain. Overall: WizeHive makes it possible to manage our grant program and the increasing number of proposals that we receive. Great experience working with Wizehive - knowledgeable, supportive assistance, product easy to use! Pros: It makes sense - it's easy to use and easy to learn! It has helped me take a time-consuming project (collecting scholarship applications) and simplify the process. Wizehive also comes with a knowledgeable staff, who is very helpful and walks me through the application and review processes. For me, learning a new software program can be daunting, but the software was easy to learn, and the online support allowed me to see and talk through each learning step. It gave me the confidence I needed to make the most effective use of this product for our Foundation scholarship program. In fact, when the Membership Department saw how Wizehive worked for our Foundation scholarship program, they decided they wanted to use it for their student competitions, and their competitions include video clips! This software is very versatile, easy to use, and adaptable to the many situations. Cons: I really do not have any cons about this software. I enjoy working with it; it has met our needs. This software has allowed us to transform the way we do scholarships. Pros: With this software we have been able to expand our program in multiple facets. Not only have we been able to add more scholarships, but we have been able to improve upon the way we administer them. The process has been simplified for our staff, our reviewers, our recommenders and our applicants. Cons: We have new scholarships every year and making changes seems to be a very complex process as those changes need to be made in numerous locations. The software is also costly to have. Overall: The software has enabled us to streamline our process in many ways, allowing us to focus our time betters serving our students, volunteers, and donors. Pros: Overall, the whole system works really well, and the reporting function is terrific. Cons: The e-mails to references seem to get caught in SPAM filters fairly often, which creates some administrative burden to follow up with those persons. And since we use the system only once a year, it is a bit pricey. Overall: We have used WizeHive for our summer internship application process and have been very, very happy with it -- it's made it so much easier for us to manage the applications we receive and to assemble data. In particular, the review functionality has streamlined our process and avoided wasteful copying. After the initial set-up, we haven't needed much support from year to year, which is terrific - but when we do they are very responsive. Hi Ilene: Thank you for your business as well as your review! If you continue to have the SPAM problem please contact us directly We send all of our emails out through a 3rd party service called that processes over 20 billion emails a month with a 99%+ deliverability guarantee so we should look into your configuration as this should not be an issue. WizeHive has been a phenomenal partner - excellent product and customer service! Pros: Our scholarship program grew to the point that we were no longer able to process paper applications. Many of our scholarships are unique - some require applications, others are team or coach selected. We needed a customized scholarship platform that could allow us to continue administering all of our scholarships and provide an easy way to track scholarship winners and process scholarship payments. WizeHive's Zengine product was the perfect solution to our scholarship program's needs! Cons: The first year we implemented the software, there were a couple of things that I thought could be improved. The WizeHive team listened to my comments and has come up with solutions to make the process even better this year! Overall: No more paper applications! Easy to track scholarship winners and process scholarship payments! Easy for scholarship selection committees to access applications from their homes - no more running to the Foundation's office to pick up paper applications and distribute them to their committee members. Much easier for students to apply for scholarships! We use Wizehive for grant & scholarship reviews. It's a great service! Pros: It's ease of use, for both administrators & users, is the best feature. We have received many compliments from our users and are often amazed ourselves at the minimal set-up requirement necessary to open a new portal. The excellent and timely customer service is a great bonus! Cons: Every once in a while a user cannot log in with the credentials assigned to them. However, this is an easy fix, and it rarely happens. I could (should) probably talk to my Wizehive support specialist and let him know...I'm confident he could fix this! Pros: I like that WizeHive is very user friendly and can be easily taught to those of all skill levels. Also, it is a great way to manage files and applications we receive. Lastly, the ability to create reports is a great tool. Cons: WizeHive works well for our application process. There isn't anything about it that poses a challenge to our process. Pros: Auto email/bulk email feature makes it easy to notify applicants. Application forms are easy to update. Can perform an entire review process through WizeHive without much need from an outside source. 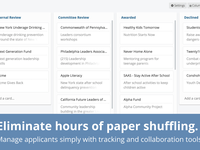 Convenient place to keep track of records of applicants and reviewers. Also helpful with creating registration forms for events. Cons: Somewhat challenging to navigate. Needs more help options and tutorials to make the user experience much easier. Still some bugs that need to be fixed (including some issues with a few of the filters in application forms). Overall: If you are needing to collect and save a lot of data from grant applicants and reviewers, this is a great system to use. There are so many functions that can be utilized to maximize the grant review experience, and the support team is always helpful with answering any questions you may have about any step. Our organization has plans to upgrade to a submission portal next year which will allow even greater ability to perform a multi-step application process, save user profiles, and allow easy follow-up with grant recipients in order to collect final reports. Pros: WizeHive provided an incredible implementation lead (Dan) to get our fellowship platform active. He provided novel ideas and features to make sure both the application and review process ran seamless. The product is solid and easy to navigate. Also, the support staff turnaround time on troubleshooting problems is faster than the speed of light. Cons: I liked everything about the product. I have nothing to add here. Wizehive is versatile, customizable, has incredible depth, functionality and great customer service! Pros: My favorite thing about the software is how much time, resources and paper it saves me. I was managing the application process manually and it was super time consuming. It's been streamlined and I'm more efficient because of that. I also am really impressed with my implementation specialist . He's been invaluable and super patient with me during the entire process. Cons: There are just a few minor things that could be improved upon, they are very specific to my review program. Mostly having to do with financial calculations. 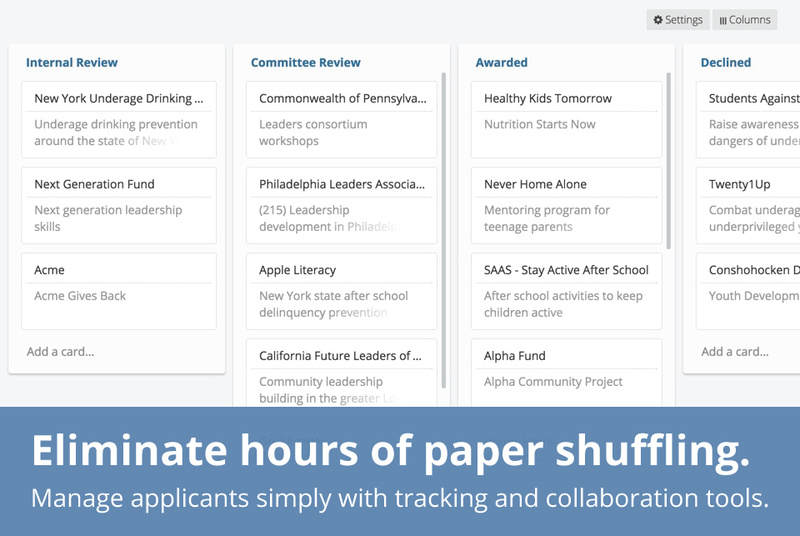 Overall: Savings on time, resources, paper and ease of use for my board to review. Pros: What has been most helpful for us is the flexible work flow and the widgets. We are still learning and understanding all the possibilities and making adjustments as we go. Cons: So far, not being able to open select fields for our end-users to modify/edit is frustrating but manageable. Also, not being able to pre-populate fields in real time is hard to explain to non-tech savvy ppl because they believe that if the information is there, it should be able to pre-populate anywhere. Ideal situation for us would not have to manually export/import data to link fields together. A flexible, adaptable tool that does not require much training for the user. Pros: It is adaptable to your needs and seems to be very robust. We rolled in a donor database, multiple scholarships, one application, a retention component and a selection process into one without having to pay for each feature. You are not boxed into one type of format and the designers seem to be very willing to add features as needed. Our contact has been great about being responsive and coaching us along the way so we get what we need on very short deadlines. Cons: The online help function is not very good. It is hard to tell how making changes in one area will affect the end result. It would be great to be able to look at other scholarship applications and be able to pick and choose from other users to create our own. Overall: It saved me from using 5 different spreadsheets and Google docs to manage 15 different scholarships, a retention spreadsheet and individual e-mails to promote scholarships and collect data. I do not think it is as expensive and difficult to use as Salesforce or other products. It does seem to be built for scholarship providers as opposed to corporate vendors/sales managers. Pros: It is relatively easy to install and extremely user friendly and intuitive. The reports in real time are amazing! All of your information is stored in one place. Cons: There are some small preference things, but they will just make a good product great! Some things would be hiding the plugins from users based on access level. Pros: My colleague talked a lot about how the software helped her to manage our application and review process. She was able to tell at a glance how the reviewers were progressing. She was also able to run reports so that we could better understand the data that we collected. The staff that I have worked with so far have been responsive and informative when I ask a question. Cons: As a small non profit, we find the software a little pricey. The amount of work that WizeHive will need to do to set up the system for the second year is significantly less than the first year, and yet the price is basically the same. Overall: We used WizeHive for the first time last year to manage our application and review process for our program. The system saved us a huge amount of time and really helped us manage and understand our data. We have just signed up for a second year! Comments: We used WiveHive to manage a small internal grant program at our university. Previously, we used Blackboard to organize the proposals, collect reviews, etc., and we nearly all quit the committee because it was so hard to work with the materials! Using WizeHive made the proposal collections, assignments, reviews, and reporting very easy indeed, with far less room for human error. WizeHive was easy to use even for people who were submitting proposals and had no familiarity with the software, and for the committee members who received a little training, it was a breeze. The one criticism I might have is that the submitter/reviewer interface is not very good-looking, but that is a small non-issue. WizeHive's customer and technical support was outstanding. They do not have 24/7 support because they are a smaller company, but they always responded promptly, even after hours at times. Problems were fixed immediately. The person assigned to me was incredibly patient and helpful, even when I was asking questions that I should have been able to figure out for myself or remember from her tutorials. We will definitely use WH again for this grant program, and I'm talking WH up to other departments on campus for things like student applications to special programs. Pros: The software was extremely helpful in transitioning our scholarship program from a paper application program to an online program for students. The amount of work it saved internally was amazing. Cons: The software was at time not intuitive, but it was overall easy to use once learned. My experience has been quick, professional and efficient from the sales process to the set up! Pros: I appreciate the ease in which we can customize the software to do exactly what we are asking it to do. The flexible platform and the supportive technology support make the process painless to set up the system to perform exactly how we want it to. Cons: It is difficult to find a negative aspect to this software. It would be nice to have more customization's available on the front end to make the application or platform look exactly as we would like it to look to our consumer. Overall: This software has allowed up to eliminate paper applications for a complex scholarship application process. It has allowed us to create an online database to track our scholars as well as our donors. Saved us so much time in grant application reviews and processing! Pros: I like most that users can log in and save their drafts before they submit the applications. 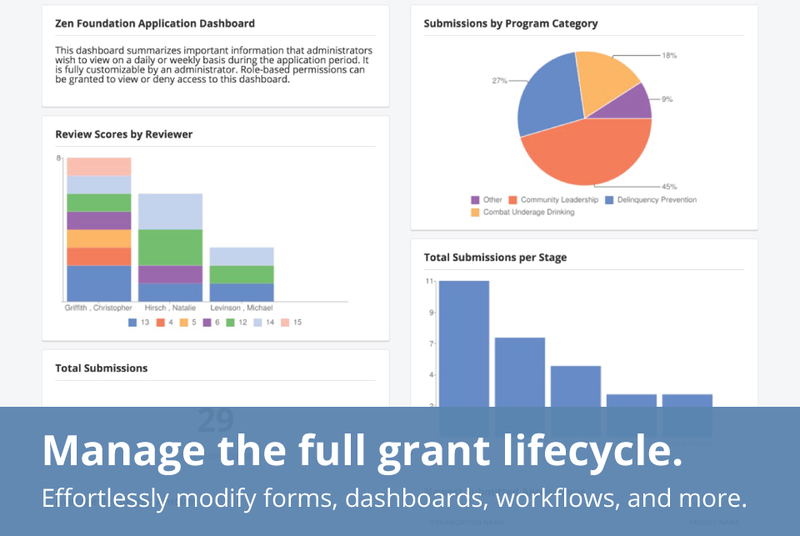 This has made it a much better user experience for our grant writers who are working across teams to obtain information for their grant application and need the opportunity to review drafts before they hit submit. 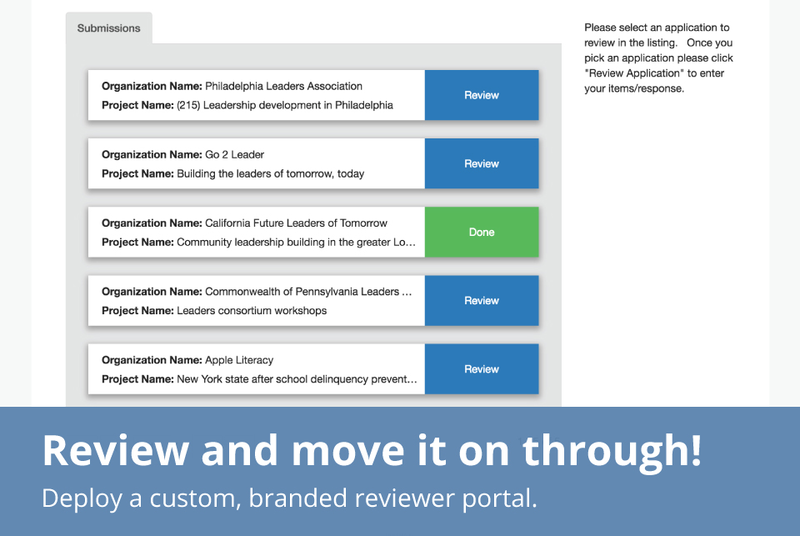 I also like that I can set up a review portal - this saved us so much time compared to how we used to do this, with Excel spreadsheets, printed copies and attachments. Cons: I wish I could have each user set up their own profile where they could see all of their applications on one dashboard. My understanding is that this is a potential future development, and I would welcome it! Overall: I really enjoy having an affordable one-stop shop for all my grants information. All my history is available in one place. I also really like the ability to hide fields and customize what my reviewers see. And we also appreciate the affordability. I like knowing WizeHive already has everything we need, and they keep the system up-to-date. Pros: It has really streamlined our selection and reporting processes, making us more consistent and able to focus on improving how we work. Cons: It didn't feel super intuitive to use at first, however the trainings are very helpful and once I got the hang of it. Comments: The software has allowed us to simplify the scholarship process. Applications from different cycles are housed in one location and cross reporting is simple and efficient. I like that the same database is used to collect applications reviews and issue and track awards making our manual system seem archaic and ineffective. The customer service is excellent and I always get immediate responses to any inquiries that I have. One con that I've found and it may be the fault of the user; applicants are not easily able to retrieve lost passwords but instead contact me and I in turn have to contact customer service. If this could be simplified online, it would be awesome! WizeHive is a wonderful product used by our Kauai United Way! Pros: WizeHive is easy to use and it's a great product that is reasonably priced as well. Cons: Only problem I face, is being in Hawaii, the time difference is sometimes a concern, but it usually works out. My previous customer support team has been awesome! Recommendations to other buyers: It is really easy to set up and if you are doing the same thing yearly and changing things such as dates and minor things, this is the product for you! We used to Wizehive to streamline and scale up the application process for our fellowships program. Pros: We have been extremely happy with our first fellowships season using Wizehive. The customer service has been superb, and we ran into few problems as we used their system to work with our procedures. Our process is complicated, and no other software fit our needs as well as Wizehive did. I would highly recommend this to anyone looking to automate and grow a fellowships program. Cons: A couple of steps required a bit more manual labor than I had hoped, but Wizehive is already talking about coming up with ways to automate this for next cycle, so it really is a small complaint. Great, robust product, increased productivity, and custom fit service - It's all here. Comments: This is my first year using the online application and I have been delighted with it as well as the service provided by WizeHive. I have a complex application system and receive a large number of applications in a short amount of time. I am a staff of one, and have been doing this for 5 years. This is the first year my scholarship process has seemed manageable; I would estimate that my productivity has doubled just by changing to this online application. And the feedback from students who applied both last year and this year have actually congratulated me on the new application, which they say is much easier to understand and use. My WizeHive representative understood my issues and was was very responsive to my requests, handling them quickly and efficiently. She knows her product well and is able to fix programming problems or help me figure out how to get the data I need through the appropriate wording on the application on one side, and report settings on the other. I highly recommend them! Comments: We spent several weeks researching several database management solutions. We left a lot of messages for companies that called us back with cookie cutter pitches. When I first met Pete from Wizehive - I was struck by two things; He was extremely knowledgeable and passionate about Current and he was genuinely interested in helping us figure out how to increase efficiency in our business model. Once I signed up for Wizehive, I was impressed how easy it was to start getting templates set up, but I still had a lot of questions to really make them come together. When I followed up, Pete set aside time for us to do extensive Q&A sessions and I still can't believe how easy it is to build, customize and create the perfect app in this system. I can not thank him enough because now I only feel limited by my imagination and creativity. My recommendation? It will take you sometime to learn everything it can do, but once you do. You will love it and all the solutions you can create with it. Pros: The software meets all our needs but the service is what makes this a "5-star" solution! Easy to configure, easy to extract data. Cons: The email plug-in is rudimentary but met almost all out needs. We have a unique problem that Wizehive continues to assess and provide work-arounds. Pros: There is tremendous flexibility in the applications we have built using wizehive - we can cut the data a million different ways! The reporting capability is really terrific too. And it works for a variety of different competitions. Cons: I'd love to see more videos or models of how others are doing what we want to do. Recommendations to other buyers: When evaluating software like this, test for how you will be model your competitions, and how you will be able to report on the data. WizeHive has proven to be an excellent tool for our University Summer Research Grant Program. Pros: With the assistance of cust support, all of our requests have been addressed and implemented thru the WizeHive system. Cons: Originally when contacting support, the responses were more generic. Once, we had a direct rep to contact, we received responses that related directly to our system. Overall: Organization of proposals submitted and reviews posted and save of man hours in contract award. Comments: I really love this product. I've been using it for a couple of months for an center for the homeless. We have hundreds of people who come to our center. And each one of them have many different problems that we need to find a solution for. But since we have only four employees it is difficult to keep track on everybody. That's why Wizehive Current has been a great help, because it makes it very easy for us to keep information of the people without losing to much time on unnecessary administrative tasks. This way, we can really focus on the people rather than becoming just another bureaucratic organization. Wizehive Current makes it very easy to build a database from scratch. A great things is the fact that it's in the cloud. I use it with a team of four people, so it's very important that all the records are saved in a central place rather than having thousands of different versions of the same excel sheet. Pros: Able to mange several programs simultaneously. Waste of time and money. Will not renew! Overall: The service has been above average but the platform is designed so poorly it takes away from any saving grace. This has been a horrifying experience for me! We're so sorry that you have found the platform difficult to use. We'd love to be able to connect with you directly about your concerns and help, but as we have not received this feedback from any of our clients we're not sure who you are or how to assist. Please reach out directly to your implementation lead. Also, WizeHive is not the administrator of any of the programs on our platform; the organizations we work with manage their programs. If you are a reviewer who is having issues with the program administrator please contact them directly. Comments: Thank you WizeHive for your excellence both as a service provider and patient teammate. Working with the WizeHive crew has been an illuminating, enjoyable and edifying process. 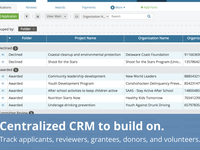 As a small community grant maker we are using Current to restructure our grantee database. Our work with WizeHive in the pass has allowed us to collect a wealth of data which we used this spring in a successful advocacy campaign to restore city funding of arts and culture organizations after a major cut. A victory for us, our grantees and the communities impacted by the power of the arts. The win also allows us to reinstate our Youth Arts Enrichment Grants. Our shiny new database will allow us to further wield our arsenal of data as well as increase our organizing and mobilization capabilities. We are excited to continue fighting the good fight for our constituents with the tools WizeHive has helped us build and hone. Fairly versatile form builder, with other types of functionality. Pros: We chose this product because of its flexibility. We were able to give our customers access to data and collect data from them without a per-user charge. WizeHive helped us to consolidate and simplify several applications, making our job much easier! Pros: It is simple. Once you are familiar with where everything is and the way it's set up, the applications are very easy to administer and update - even for people who aren't good with technology. Cons: My least favorite feature was the way folder assignments had to be made individually, but I expressed this concern and my implementation specialist helped add a feature so that I could move larger numbers at one time. Pros: The software is very user friendly and logical. The training and supports received from Wizehive (Taylor) were top class. Cons: Being able to automatically link emails to applications or contacts would be a significant advantage. 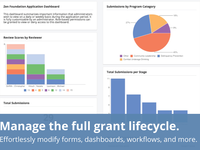 Overall: Wizehive has allowed us to run multiple application processes right through to Grantee management. The support and training was top class. Where there wasn't an obvious solution to a problem Taylor engineered one. Pros: Easy for applicants to negotiate. Great back end support. Cons: Somewhat difficult to search for "do-it-yourself" help. Recommendations to other buyers: Rely on your support team and test, test, test, test. Comments: Wizehive is exactly what my company had been searching for. We had originally been collecting our data in simple excel sheets, which was not very productive and absolutely chaotic. When we discovered Wizehive everything changed. It comes with a few templates that every business would use and it is fully customizable so you can use it how ever you want. Their customer service is phenomenal, the guys on the team showed us how to use the software, critiqued our workspaces to show us how we can use it better, and is almost always available to help you out. I couldn't ask for a better product or team to work with. If you are looking for a good software to manage your data and keep track of everything than I HIGHLY suggest going with WizeHive. No other software comes close to what they have to offer. Comments: I have had a wonderful experience working with Peter with WizeHive in working to make our business more efficient. We have been trying for the past 9 months now to find a program that will work for us. We have tried working with 2 developers that could not quite understand our business structure and therefore could not help us accordingly. I was fervent in my efforts to try to find something that would work for us and came across this database software. I explained to Peter all the things I'd like to do and he immediately understood. He has gone above and beyond in helping us reach an efficiency goal that we have been looking to attain for quite sometime. Thanks to WizeHive our business can now begin the efficiency process. Comments: Before WizeHive, our department had lots of files and paperwork to keep track of. We were constantly going back and forth with our clients about sending us certain documents or requirements that we need in order to do our job effectively. Our clients would always complain that our applications were to confusing, time consuming etc. Since we have been using Wizehive, we have had 0 complaints and plenty of compliments. the part we love the most, we do not have to keep track of 100's of files anymore. We don't have to go back and forth with our client because it is all a requirement in our Wizehive submissions. It is still fairly new to us, but so far it has been nothing but great. The PBTF has three work spaces with Wizehive: scholarship application, grant application and a recipient-volunteer reporting program. Each work space envisioned came to life with improvements from Wizehive. All of the data, applications, required documents and so forth are in one place which saves so much time and effort. Now we can spend more time in our mission to cure the kids. Wizehive is truly a user-friendly software program. Wizehive's technicians and customer service are reliable. Troubleshooting with Wizehive's technicians is a time for programmatic enhancements. Their customer service never disappoints and they also respond within a timely manner. I absolutely love WizeHive! If you're looking into a new software system I strongly recommend them. Pros: The software is easy to use for the administrator and the user. The team lead will ensure the administrator has the information and tools needed to successfully use the software. Cons: So far, I haven't encountered any barriers or dislikes with the software. Hopefully, the smooth transition will continue. Comments: Our organization has been using WizeHive for over three years. Using WizeHive has streamlined our process and has made managing our scholarship application process easier. The staff at WizeHive continues to be responsive to our needs and treats us like a priority and valued customer. We have been excited about the updates and upgrades that WizeHive has made over the years. This updates have continued to make managing our application process and the various application components easier. We have expanded our use of the Select platform and now use it manage other components of our scholarship program. It helps having everything in on consolidated resource. Comments: We're starting into our third year using WizeHive to administer scholarship and grant applications. The software is intuitive and user friendly for us on the back end and we've gotten positive feedback from our review committees about their user experience as well. It's a pretty standard online application format for applicants and any questions they've had have been easily resolved. We've been very pleased with the responsiveness, professionalism, and competence of the Wizehive staff too. Using this system has made our application/review processes more efficient and we've been very satisfied with the software and our overall experience. Comments: I am the administrator of a nonprofit that gives out grants to PhD students. Before we moved to WizeHive we had a long email and paper-trail for each applicant. Now everything is centrally located and stored in the cloud. We've streamlined the application, administration, and review process, which has allowed us to spend more time on getting the right applicants. While there are always 'nice-to-have' items on the list when looking at new software, the programmers would always try to find a solution. Overall, the applicants, reviewers and myself as the administrator, are very happy with the service. Comments: We are creatives. We don't do paperwork. Any form of paperwork is always a huge nightmare for us. Luckily we found Wizehive. Their product is simple enough to setup and advanced enough to help us keep track of sophisticated projects, budgeting and general task management. A must for all startups! Also, a big thumbs up for awesome customer service. They we're quick to respond to any queries I had and they took the time to learn about our business and what features we would like to see i the future. I do however recommend that all new users follow their training/tutorials to get a grip of everything on offer. WizeHive has simplified as well as significantly improved our process. Comments: Together, we have developed a process that works more efficiently for both grant reviewers and applicants. Our customer service and product reliability have been exceptional. Since launching WizeHive, I have not had one single concern about technical performance. This stands in contrast to my initial homegrown process. It is hard to quantify the value of the mental reassurance I now possess with my WizeHive solution. I have been extremely satisfied with our decision to implement WizeHive for our grant management system. Pros: Easy to use. Intuitive interface. Separate workspaces are neatly organized. Workspaces are very easy to customize based on project. Cons: The website can be glitchy from time to time but it resolves itself. 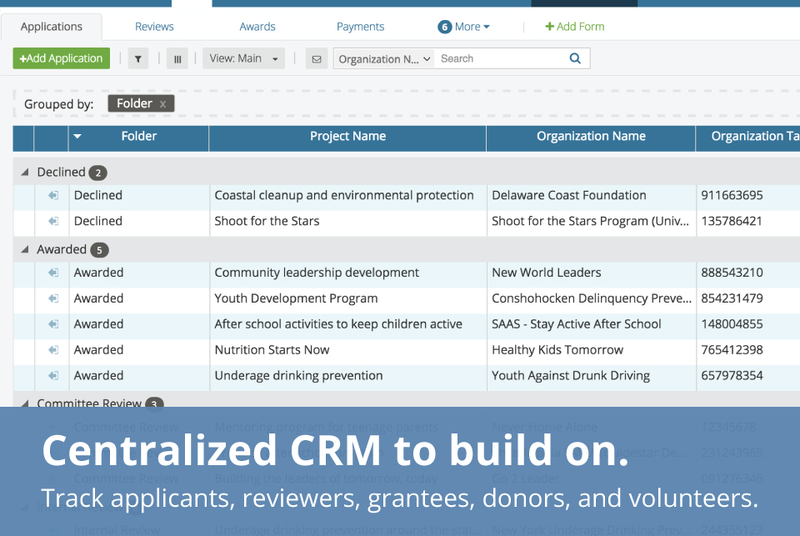 Recommendations to other buyers: Functionality is great for nonprofit grant management. Comments: Ease of use for administrator and user is a positive. Ease of reporting and creating new reports is a positive. Thanks for the review and feedback. We are happy and proud to continue to work with you to ensure that you will also become an expert at the system.. Cheers! Comments: Wizehive is a perfect solution for the capturing, storing, and review of multiple data points and content supplied by applicants. 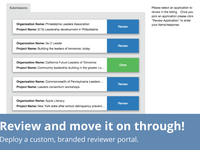 Love the review options; that we can provide full or part access, to specific level reviewers as needed. Where I lacked in knowledge for set up and execution, Wizehive's Josh Thorne jumped in as needed to provide top notch support and ideas to create a better online experience for our clients, and has been 100% helpful, patient, and kind. Comments: Before we started using WizeHive, our Scholarship and Grant competitions were an arduous task that took up more than half of our Programs staff's time. With WizeHive, our competitions are completely streamlined, allowing our staff to focus on developing new programs and growing the organization as a whole. WizeHive is an intuitive program that is easy to use for everyone including applicants, administrators, and reviewers, and their helpful support staff is always friendly and responsive! with Wizehive in July 2014! Comments: WizeHive has truly transformed our application process! The ease of use on both the front and back end of the system is very attractive to our applicants and incredibly helpful for our staff. Beyond that, a knowledgeable and easily accessible WizeHive staff ensures that any questions and/or concerns (and there haven't been many) are addressed with the utmost importance and in a timely manner. We are excited to continue our partnership with WizeHive.